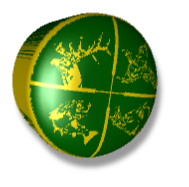 Alex started on the estate in June 1979 and took over from his father in 1985. He is the fourth generation on the estate, going back to his great grandfather in the 1880’s. After 4 years of training, he has been taking guests out every season since. In 2007 a party of 8 guests all shot their first stags in one week which included a husband and wife both achieving this on the same day. Alex was born in Achnacarry and lived in Ardechive house as a youngster, so has extensive knowledge of the local history, geography and nature of the area. 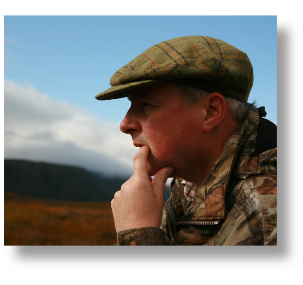 Alex is one of the founder directors of Achnacarry Sporting & Country Pursuits. Simon’s family have been associated with Achnacarry since soon after World War II. In 2011 David Laird, Simon’s father, will make his 60th consecutive annual visit to the estate. 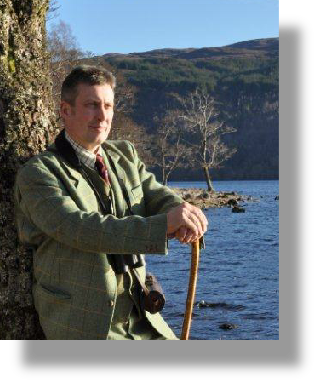 Simon has property and farming interests on the East Coast and in 2009, after visiting Achnacarry every year since 1987, purchased Ardechive from Lochiel. The house and cottage on Loch Arkaig have been extensively refurbished, and are available for rent. Brian Ainsworth works as a clay shooting coach and tour guide. He is and experienced shot, shooting both clays and game for many years. He also guides the scenic and wildlife tours. Billy Neil also ghillies for the South side of Loch Arkaig and has a good knowledge of fishing on the Loch. He has been working on the estate since 2007. Billy also has unparalleled knowledge of trout fishing opportunities throughout Lochaber. Jimmy MacDonald works as a ghillie during the stalking season. He is also a keen fisherman and will be taking fishing parties out on Loch Arkaig and up to Loch Blar. Jimmy has been working on the estate since 2005, but being local has extensive knowledge and anecdotes about the area.